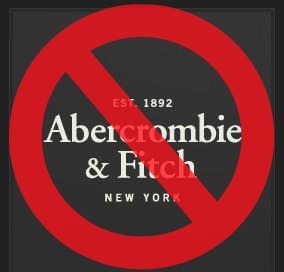 In case you have not heard, which would be pretty hard, since it’s practically being screamed from every mountain top, as it should be, the pathetic and gross CEO of the sad and disgusting clothing store Abercrombie & Fitch is really a class A, Number One PIG. And while there have been loads of press on this totally awful human being, I am partial to Ellen’s send-up of Mike Jeffries, a man who does not want to find himself stuck in an elevator with me (or any other woman, and especially not my 15 year old daughter–actually that would be a very good thing for him. A few minutes with Ally and she just might straighten out his thinking). Mr. Jeffries, who’s very name pains me to write, except that it is a good one for you to know, so you can wish for him every red light (or worse) for the rest of time, says that his strategy for A&F is simple. They don’t want fat people to wear their clothing. They do not carry over a size 10. (H&M carries up to size 16, and American Eagle goes one size larger with a variety of clothing in size 18 by the way.) So, if you’re going to take your daughter shopping at A&F, don’t let her eat breakfast (or anything else), because we are talking about clothes for the tooth fairy. Oh Mr. Jeffries, here are a few questions for you to ponder, as you try and create a brand that relies on the “cool” kids. Have you heard about how hard it is to be a teenager these days? There is the pressure of social media, epic numbers of divorce, bullying, and depression to deal with daily. Are you aware of the number of eating disorders that occur in our teenage population? Do you know what it’s like to be excluded and unable to wear the cool clothes, and to try to, because you think the only way you can fit it in, is if you fit into a pair of shorts that only a genetically minute or a pre-pubescent girl can wear? Do you understand that your retail strategy is part of the problem, THE BIGGER PROBLEM of teenage self-esteem? DID YOU GO TO COLLEGE WITH HITLER? Woweee. This dude is perhaps inhuman, perhaps just stupid? I am not the first to say it, but DON’T GO NEAR AN ABERCROMBIE & FITCH. Don’t let your girls or boys buy their teeny tiny clothing. Picket this store. Don’t stand for it. Don’t sit for it either. And above all, DON’T BUY IT. that man should be made to squeeze into one of his size 0 shorts! I just cleaned out my closets and through away an old A&F T-shirt from years ago. Glad I did. I couldn’t fit into it these days, anyway! Guess I never knew how “lucky” I was to be allowed the privilege to shop in the store and own a piece of that brand. NOT! you were so lucky, ron! glad you threw that shirt out.